Casa na Colina is a luxury villa home in exclusive Carvoeiro Club, set in its own secluded garden with lawns, bougainvillaea, olive, jacaranda, orange and lemons trees, on a hill not far from picturesque Carvoeiro village. There are spectacular, panoramic views to the ocean 600m away and all along the coast. 10 x 5m private swimming pool. Pool heating at extra cost is optional. The house is air-conditioned and and centrally heated throughout (air-conditioning, central heating and logs for the fire included in the price. )The house is maintained and equipped to the highest standards. Celeste, our perfect housekeeper, provides a full maid service and ensures that linen is spotlessly clean and the beds are changed twice a week. 2 good golf courses a mile away. Wifi internet connection. There are four bathrooms, one en suite to every bedroom, each with bath, shower, wc and (except bathroom 4) bidet. The large lounge and the dining room are at 1st floor level - to make the most of the view! Internet TV with Sky Sports & Movies. Air-cond & central heating in every room. Grate for log fires on cool evenings. The well appointed kitchen is fully equipped. Apart from ample crockery, cutlery and kitchen utensils, there are gas and electric hobs, electric oven, fridge, freezer, microwave, dishwasher, washing machine etc. There are two good golf courses about a mile away and flood lit tennis courts within walking distance. Discounts for golf and tennis are available on application for guests in our house. Not far away the children will love Slide and Splash water park. Notes on accommodation: There is a large shady terrace outside the lounge, dining room and kitchen - marvellous for outdoor meals. Also, a large built-in cushioned seat for snoozing and enjoying the view. Air conditioning and central heating and logs for the fire are included in the price. 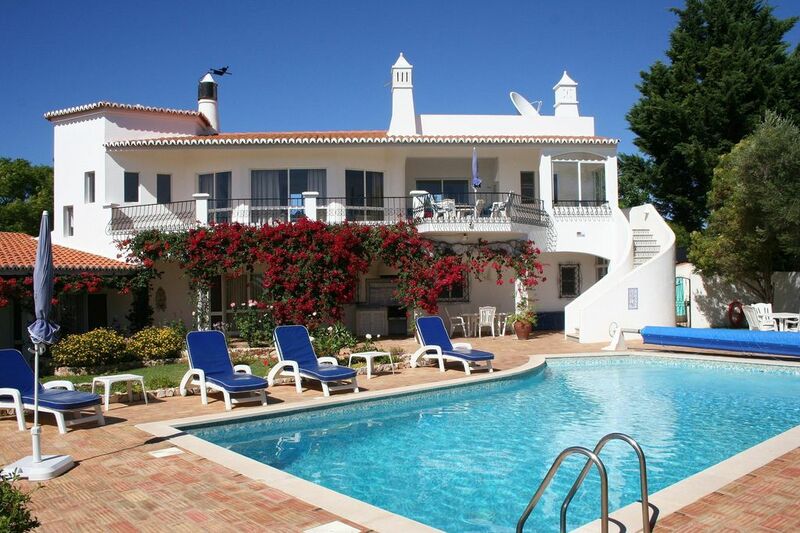 Outside: Casa na Colina has its own heated 10 x 5m swimming pool (Heating at extra cost is optional.) The pool is surrounded by a spacious sitting area with lots of pool loungers. There are gentle staircase steps to the shallow end (80cm deep) -deepend (2m deep). A safety net to protect children from the pool is available. Pool side fridge. Pool shower room and wc. BBQ. Garage. Cleaning / Towels / Linen / Maid service: Celeste, our kind and efficient housekeeper, who comes every weekday, cleans the house, makes the beds, washes up and, on request, does personal laundry. Towels supplied and changed twice weekly. Own towels needed for pool and beach. It was a privilege to stay in this villa, with beautiful pool, private bedrooms, comfortable beds, outstanding view, close to beach and city center. Wished could have stayed here a couple of weeks to fully enjoy it. Caretaking lady was fabulous, fun and owners very helpful and kind, could not ask for more, we were spoiled! What a beautiful house and garden with a fabulous panoramic sea view. Great sunset aperitifs on the balcony & relaxing by the heated pool! Quiet and restful, with the town centre, incredible beaches & restaurants all within a few minutes drive or 15 minutes walk. The house is spotless and perfectly equipped. Celeste the house keeper is fantastic. Beskrivelsen og billederne af villaen lyver ikke - det er en fantastisk villa med en perfekt beliggenhed, når man gerne vil bo i fred og ro - og så alligevel en spadseretur på kun 15 min til stranden og midtbyen. Vi var 8 personer - 4 par - og der var rigelig plads i de 4 dejlige værelser med hver sit badeværelse. Men vi var næsten ikke indenfor, for den dejlige balkon med udsigt over poolen, haven, palmerne og længeren væk havet trak konstant i os - når vi da ikke var ved poolen eller i haven. Mange tak til Helen og David og tak for lån af villaen - og tak for den flotte korrespondance og information, I leverede op til ferien. Vi kan kun give vore bedste anbefalinger - villaen og området skal opleves. Thank you to Bodil and Poul for your kind words about our house. Reserve early for this wonderful holiday home! Husband, daughter, grandson and I thoroughly enjoyed our stay at Casa na Colina, in Carvoiera. The heated pool was the main attraction for our 7 year old grandson, while we appreciated the gorgeous views of the sea and the proximity to the lovely town of Carvoiero some of the finest beaches in Europe. I had constant contact with the owners, who we found to be very kind and extremely helpful. We wanted to take the housekeeper, Celeste, home with us, as she is excellent. We hope to stay at Casa na Colina again, soon, but as we learned this year, one needs the book early, because the word is out that this is a great place to stay. Eine sehr gepflegte, große Villa mit viel Platz, großem Garten und einen wunderschönen großen Pool. Viel Platz für Kinder zum austoben. Jedes Schlafzimmer hat eigenes Badezimmer. Wir waren insgesamt 8 Leute und haben uns gegenseitig nicht gestört. Ein schöner Ausblick von der Terrasse oben. Kann man entspannt sitzen und Sonnenuntergang genießen. Küche gut ausgestattet. Alles nötige, wie Waschpulver, Tabs etc. vorhanden. Unter der Woche kommt Haushaltshilfe und räumt auf, wechselt die Handtücher, macht Betten... Man kann entspannt den Urlaub genießen. We had glorious 10 day stay in this fabulous villa. The place was kept spotless by a delightful maid. She was cheerful and friendly. Luxurious fabrics have been used in all the living areas including the bedrooms. The hall with it's chandelier and winding marble stairs puts you in mind of South Fork and Dallas. No attention to detail has been overlooked with a well stocked kitchen with all the gadgets you could need, beautiful pictures and pottery from Porches pottery about 5 miles away. There is one little, sandy beach between our house and Carvoeiro, another in the village, and lots of other lovely, sandy beaches within 10 to 15 minutes by car. From Faro airport it takes about 50 minutes to drive to our house - mostly along the new motorway. Car hire is recommended. Lisbon and Seville are each about three hours drive. Carvoeiro village is about 800m away with its beach, little shops and many restaurants. Lagoa, 5 km inland, has a daily, indoor fresh food market. There is a large Intermarche supermarket on the way there. Nearby facilities include water parks, sailing and boat trips. Ancient Silves is well worth a sight seeing visit. A trip to the hills round Monchique makes a pleasant outing. Cape St Vincent with its massive cliffs is the south west corner of Europe is less than an hour by car and on the way the attractive town of Lagos should not be missed. Booking Notes: A non refundable deposit of 20 per cent is payable on booking with the balance payable 28 days before arrival. Changeover Day: Flexible. Notes on prices: Prices are for the property per week in UK Pounds. Reductions may be available for smaller parties.